Different touch technologies react to different objects. It doesnt matter if you use a finger, glove or credit card, in various situations diverse objects must be able to activate user interfaces and navigate software, otherwise imprecise operation and erroneous data entry may result. 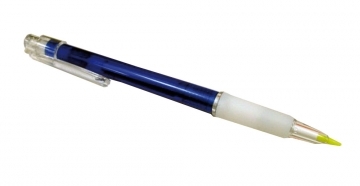 Our touch pens are a professional activation devices for all touch technologies. Using this featherweight pen, you touch the user interface and calibrate it with pixel precision, while avoiding any scratching caused by improper objects. With its ballpoint pen shape, the user can comfortably carry it in their clothing or take it along with them in their pocket, keeping it always within reach and available immediately.